Monitor your videos and compose your shots with the GyroVu Lightweight 4K 5" On-Camera HDMI Monitor, which includes a 360° swivel mount for DJI Ronin-S gimbal stabilizers. Using an 8-bit 1920 x 1080 IPS LCD panel with a 1000:1 contrast ratio, 400 cd/m² brightness, and a 170° viewing angle, focusing by eye is possible, and critical focus can be achieved using the pixel zoom function. Since this monitor is lightweight, using it atop a small mirrorless camera won't add bulk to a compact setup. The HDMI input accepts DCI and UHD 4K resolutions, allowing the camera provide a sharp image to use for framing. The monitor's dual-purpose battery plate will accept either L-series batteries or LP-E6 batteries. 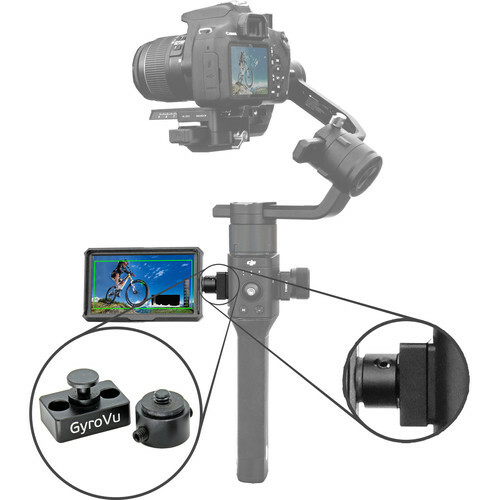 A 360° swivel mount is included, designed to attach to the handle of a DJI Ronin-S stabilizer. Also included are a sun hood for blocking reflections and glare, a shoe mount with a ball head for placing the monitor atop your camera, two Allen wrenches to tighten the mount screws, and a mini-HDMI to HDMI cable. Lightweight 5" on-camera monitor with 1920 x 1080 resolution; accepts up to DCI and UHD 4K HDMI input and active loop out. Dual battery plate accepts two Sony L-series or two Canon LP-E6 batteries. Wide color gamut, 400 cd/m², 1000:1 contrast ratio, 170° viewing angle. Features include histogram, 2-channel audio monitoring, zebra, safety zones, pixel zoom, and more. Audio features include a built-in stereo speaker and a headphone jack. Includes a monitor hood, HDMI cable, a shoe mount adapter, and a 360° swivel mount designed to mount your monitor on a DJI Ronin-S handle. Allen wrenches and screws are included to attach the mount. Box Dimensions (LxWxH) 6.75 x 5.0 x 2.5"
it has a focus peaking to work with sony a7s ii ? This monitor does not list focus peaking. It does have pixel zoom function.